Subject :READ THE ATTACHED DOCUMENT IS AN EXAMPLE OF TRANSFER WE MADE TO ANOTHER BENEFICIARY. NEW SECRETARY TO THE GOVERNMENT OF FEDERATION. You just keep wasting your time and money with the IMPOSTORS and UNSCRUPULOUS OFFICIALS of the Banks you are dealing with believing that you will receive your payment from them, they are fake and dont have any of your fund, they just keep extorting money from you in pretense of helping you. Like I stated to you in my previous email message to you that in President Buhari effort to eradicate corruption and to bring the glory of this Nation back to the International Community and to end the decades of delay and difficulties the foreign beneficiaries are passing through in receiving their over due payment from this Country. President has stopped all the Bank from handling any outstanding debt payment due to so many fraudulent activities going on in the banking sector, which President find out as part of the delay and the reason why you have not receive your payment. The president has initiated a new payment method called PRESIDENTIAL INSTALLMENT PAYMENT INITIATIVE (PIPI) and appointed my office to supervise and monitor the entire process to ensure that the 22 selected beneficiaries receive their payment without any delay, because his Excellency has lost confidence in Nigeria Banking Sector, who are full of corrupt staffs. Under this new payment method, we have being deliberated to allow Beneficiaries the privilege of receiving their Funds installments, since they find it difficult in paying the complete fee to receive the fund once. For us to proceed in processing your payment, you are advised to choose the best option suitable for you in receiving your fund. OPTION-A ($ 30 0) fee will facilitate the transfer ONE MILLION DOLLARS (US$1,000,000.00) only into your bank account.OPTION- B ($750) fee will facilitate the release of QUARTER of your approved fund, which is (US$2,500,000.00) only to your bank account. OPTION-C ($1500) fee will facilitate the release of HALF of your approved fund, which is (US$5,000,000.00) only to your bank account.And finally OPTION-D ($3000) fee which is the total fee will facilitate the release of your Full Approved Contract/inheritance Funds of US$10,000,000.00 direct into your bank account without any hindrance. In my own view, I will advise you to go with first option and immediately you receive the first installment payment of US$1MILLION, you can now use money from there to facilitate the transfer of the remaining balance directly into you account, but if you have the complete $3,000 to receive your full US$10MILLION Approved fund once, then go for it that will reduce stress and time for both of us as well. This new payment method is working well and many beneficiaries are now enjoying this opportunity and yours will not be exceptional. My office will prepare every thing concerning your payment, both the clearances and approvals, then present it to our paying bank and stay there to monitor and ensure that the money is transferred to you without any excuse or delay or stoppage, because this order is from President and we dont want any delay or any thing that will dent the image of this new Government as they did to the Past Government. So in order to proceed, choose the installment plan you want and send the required fee to us through Western Union or Moneygram with the name of our receiving officer via the information below. Senders Address. . . . . . . . .
MTCN or REFERENCE NO. . . . . . .
Make the payment now and send us the payment information like MTCN or Moneygram Reference number. Upon the confirmation of the payment, with your banking particulars where the fund will be transfer to you, we will immediately process and facilitate the transfer of whichever installment option you choose direct into your bank account. And once the transfer is done, we shall send to you all the transfer information for your confirmation and it will not exceed 48hours to hit in your bank account because we plan to use Electronic Telex wire transfer to make the transfer to your bank, so that it will be more faster. Note that your fund has being approved and seal by the Government not to be deducted by any other person apart from the real beneficiary to the fund, because if they don' t do that, some bank and Government officials use the opportunity to thief or even divert the beneficiary fund into their partners account abroad and sign that beneficiary has received his or her fund, the only person that can have access of withdrawing money from your fund is only you, so there is no possibility of deducting any fee from your approved fund. Forward the payment information to this office as soon as you can and reconfirm your personal and bank account details to us, were you will like us to transfer your fund to you to avoid any mistake, and note that we are under mandate by the President to complete this payment assignment, so you are advised to hasten up with your plans in sending the required fee and bank account were the fund will be transfer to you, so that we can get this fund transfer to you before the expiration of the mandate to avoid cancellation of your approved fund. This is top secret as am not suppose to disclose another person transfer information to you, but I just doing it to show you that this new payment method is working well. 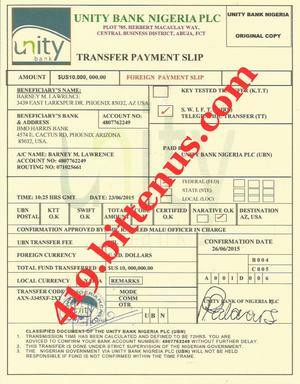 A ttac hed document is an EXAMPLE of the Transfer document we made to one the beneficiary that was assigned together with you, he chooses OPTION-D, and paid $3,000 and we use it to facilitate the transfer of his complete approved US10MILLION payment into his bank . 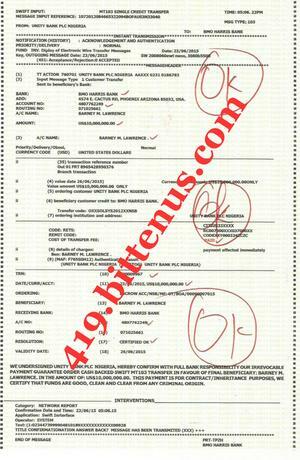 So if you dont have the complete $3000 to facilitate all the transfer once into your account as this man did, then choose the amount and option suitable for you and send the fee immediately and we will get your fund transfer to you without any delay. Stop wasting your Time and money with impostors and do not allow your past experience to cost you this great opportunity you have. Many beneficiaries are now smiling home with their payment under this new payment method Initiated by New President to help beneficiaries to receive part of the money owing them and not story all the time. President is an action man and he want to use this new payment method to put money in beneficiar ies pocket, because many beneficiaries has complain that they have never receive a DIME from all the past effort they made to receive their payment from the past Government , so president want to correct the system and help. So if it warrant you of borrowing money to participate in this payment process. Then do that fast for your own good.Because the New Government will not be held responsible if your delay or reluctant to send the required facilitation fee cost you to loose your fund, so heed to our advise to choose the installment. Option you want and send the required fee immediately for an immediate remittance of your fund, time is running out. Call me on this bellow number if you have any question.